Miller, T.S., Brooks, T.D., Stelz, W.G., and others, 1981, Geohydrology of the valley-fill aquifer in the Cortland-Homer-Preble area, Cortland and Onondaga Counties, New York: U.S. Geological Survey Open-File Report 81-1022, 7 sheets, scale 1:24,000. Moore , R.B., LaFleur, R.G., and others, 1982, Geohydrology of the valley-fill aquifer in the Sprout and Fishkill Creeks area, Dutchess County, New York: U.S. Geological Survey Open-File Report 82-81, 6 sheets, scale 1:24,000. Anderson, H.R., Stelz, W.G., Miller, T.S., and others, 1982, Geohydrology of the glacio-lacustrine aquifer in the Fulton area, Oswego County, New York: U.S. Geological Survey Open-File Report 82-83, 7 sheets, scale 1:24,000. Brown, G.A., Moore, R.B., Mahon, K.I., and Allen, R.V., 1981, Geohydrology of valley-fill aquifer in the Schenectady area, Schenectady County, New York: U.S. Geological Survey Open-File Report 82-84, 6 sheets, scale 1:24,000. Miller, T.S., Belli, J.L., and Allen, R.V., 1982, Geohydrology of the valley-fill aquifer in the Corning area, Steuben County, New York: U.S. Geological Survey Open-File Report 82-85, 6 sheets, scale 1:24,000. Miller, T.S., Randall, A.D., Belli, J.L., and Allen, R.V., 1982, Geohydrology of the valley-fill aquifer in the Elmira area, Chemung County, New York: U.S. Geological Survey Open-File Report 82-110, 7 sheets, scale 1:24,000. Anderson, H.R., Dineen, R.J., Stelz, W.G., and Belli, J.L., 1982, Geohydrology of the valley-fill aquifer in the South Fallsburgh-Woodbourne area, Sullivan County, New York: U.S. Geological Survey Open-File Report 82-112, 6 sheets, scale 1:24,000. Anderson, H.R., Stelz, W.G., Belli, J.L., and Allen, R.V., 1982, Geohydrology of the valley-fill aquifer in the Jamestown area, Chautauqua County, New York: U.S. Geological Survey Open-File Report 82-113, 7 sheets, scale 1:24,000. Moore, R.B., Cadwell, D.H., Stelz, W.G., and Belli, J.L., 1982, Geohydrology of the valley-fill aquifer in the Ramapo and Mahwah Rivers area, Rockland County, New York: U.S. Geological Survey Open-File Report 82-114, 6 sheets, scale 1:24,000. Holecek , T.J., Randall, A.D., Belli, J.L., and Allen, R.V., 1982, Geohydrology of the valley-fill aquifer in the Endicott-Johnson City area, Broome County, New York: U.S. Geological Survey Open-File Report 82-268, 5 sheets, scale 1:24,000. Waller, R.M., Holecek, T.J., Stelz, W.G., Belli, J.L., and Mahon, K.I., 1982, Geohydrology of the preglacial Genesee valley, Monroe County, New York: U.S. Geological Survey Open-File Report 82-552, 5 sheets, scale 1:24,000. Reynolds, R.J., 1985, Hydrogeology of the Clifton Park area, Saratoga County, New York: U.S. Geological Survey Water-Resources Investigations Report 84-4031, 6 pls., scale 1:24,000. Terry, D.B., Pagano, T.S., Shaw, M.L., and Ingram, A.W., 1985, Geohydrology of the valley-fill aquifer in the Cohocton area, upper Cohocton River, Steuben County, New York: U.S. Geological Survey Water-Resources Investigations Report 85-4040, 7 pls., scale 1:24,000. Pagano , T.S., Terry, D.B., and Ingram, A.W., 1986, Geohydrology of the glacial-outwash aquifer in the Baldwinsville area, Seneca River, Onondaga County, New York: U.S. Geological Survey Water-Resources Investigations Report 85-4094, 7 sheets, scale 1:24,000. Pagano , T.S., Terry, D.B., Shaw, M.L., and Ingram, A.W., 1985, Geohydrology of the valley-fill aquifer in the Bath area, Lower Cohocton River, Steuben County, New York: U.S. Geological Survey Water-Resources Investigations Report 85-4095, 7 pls., scale 1:24,000. Terry, D.B., Pagano, T.S., and Ingram, A.W., 1986, Geohydrology of the glacial-outwash aquifer in the Batavia area, Tonawanda Creek, Genesee County, New York: U.S. Geological Survey Water-Resources Investigations Report 85-4096, 7 sheets, scale 1:24,000. Zarriello , P.J., 1987, Hydrogeology of the Salamanca area, Cattaraugus County, New York: U.S. Geological Survey Water-Resources Investigations Report 85-4149, 5 pls., scale 1:24,000. Zarriello , P.J., and Reynolds, R.J., 1987, Hydrogeology of the Olean area, Cattaraugus County, New York: U.S. Geological Survey Water-Resources Investigations Report 85-4157, 9 pls., scale 1:24,000. Reynolds, R.J., 1988, Hydrogeology of the Croton-Ossining area, Westchester County, New York: U.S. Geological Survey Water-Resources Investigations Report 87-4159, 5 pls., scale 1:12,000. Casey, G.D., and Reynolds, R.J., 1989, Hydrogeology of the stratified-drift aquifers in the Rome area, Oneida County, New York: U.S. Geological Survey Water-Resources Investigations Report 88-4155, 8 sheets, scale 1:24,000. Casey, G.D., and Reynolds, R.J., 1989, Hydrogeology of the stratified-drift aquifers in the Utica area, Oneida County, New York--part 1 (west): U.S. Geological Survey Water-Resources Investigations Report 88-4194, 8 sheets, scale 1:24,000. Casey, G.D., and Reynolds, R.J., 1989, Hydrogeology of the stratified-drift aquifers in the Utica area, Oneida and Herkimer Counties, New York--part 2 (east): U.S. Geological Survey Water-Resources Investigations Report 88-4195, 8 sheets, scale 1:24,000. Reynolds, R.J., and Garry, J.D., 1990, Hydrogeology of the valley-fill aquifer at Owego, Tioga County, New York: U.S. Geological Survey Water-Resources Investigations Report 89-4000, 8 sheets, scale 1:24,000. Miller, T.S., Warren, C.C., and McPherson, W.S., 1990, Geohydrology of the surficial aquifer in the Hornell area, in Steuben and Allegany Counties, New York: U.S. Geological Survey Water-Resources Investigations Report 89-4053, 7 sheets, scale 1:24,000. Miller, T.S., and Sherwood, D.A., 1993, Geohydrology and water quality of the Sand Ridge glacial-drift aquifer in Oswego County, New York: U.S. Geological Survey Water-Resources Investigations Report 91-4042, 31 p., 3 pls., scale 1:24,000. Reynolds, R.J., 1999, Hydrogeology of the Schodack-Kinderhook area, Rensselaer and Columbia Counties, New York: U.S. Geological Survey Open-File Report 97-639, 73 p., 4 sheets, scale 1:24,000. Garry, J.D., 1999, Hydrogeology of the valley-fill aquifer in the Port Jervis area; Orange County, New York, Pike County, Pennsylvania, and Sussex County, New Jersey: U.S. Geological Survey Open-File Report 98-275, 4 sheets, scale 1:24,000. Reynolds, R.J., 2002, Hydrogeology of the Waverly-Sayre area in Tioga and Chemung Counties, New York and Bradford County, Pennsylvania: U.S. Geological Survey Open-File Report 02-284, 6 sheets, scale 1:24,000, CD-ROM. Hetcher , K.K., Miller, T.S., Garry, J.D., and Reynolds, R.J., 2003, Geohydrology of the valley-fill aquifer in the Norwich-Oxford- Brisben area, Chenango County, New York: U.S. Geological Survey Open-File Report 03-242, 7 sheets, scale 1:24,000. Hetcher-Aguila, K.K., and Miller, T.S., 2005, Geohydrology of the valley-fill aquifers between the Village of Greene, Chenango County and Chenango Valley State Park, Broome County, New York: U.S. Geological Survey Scientific Investigations Map 2005-2914, 8 plates, 1:24,000 scale, CD-ROM. Reynolds, R.J. and Calef, F.J., III, 2010, Hydrogeologic data update for the stratified-drift aquifer in the Sprout and Fishkill Creek valleys, Dutchess County, New York: U.S. Geological Survey Scientific Investigations Map 3136, 4 sheets, 1:24,000. Heisig, P.M., 2012, Hydrogeology of the Susquehanna River valley-fill aquifer system and adjacent areas in eastern Broome and southeastern Chenango Counties, New York: U.S. Geological Survey Scientific Investigations Report 2012–5282, 21 p.
Miller, T.S., and Pitman, L.M., 2012, Hydrogeology of the stratified-drift aquifers in the Cayuta Creek and Catatonk Creek valleys in parts of Tompkins, Schuyler, Chemung, and Tioga Counties, New York : U.S. Geological Survey Scientific Investigations Report 2012-5127, 1:24,000. Heisig, P.M., (in review), Hydrogeology of the Ramapo River – Woodbury Creek valley-fill aquifer system and adjacent areas in eastern Orange County, New York: U.S. Geological Survey Scientific Investigations Map. A. Miller, T.S., Sherwood, D.A., and Krebs, M.M., 1989, Hydrogeology and water quality of the Tug Hill glacial aquifer in northern New York: U.S. Geological Survey Water-Resources Investigations Report 88-4014, 60 p., 24 pls., scale 1:24,000. B. Reynolds, R.J., 1984, Hydrogeologic appraisal of a stratified-drift aquifer near Smyrna, Chenango County, New York: U.S. Geological Survey Water Resources Investigations Report 84-4029, 53p., 6 sheets, 1:24,000 scale. C. Reynolds, R.J., 1986, Hydrogeology of the Fort Drum area, Jefferson, Lewis, and St. Lawrence counties, New York: U.S. Geological Survey Water Resources Investigations Report 85-4119, 6 sheets, 1:48,000 scale. D. Yager, R.M., Zarriello, P.J., and Kappel, W.M., 1985, Geohydrology of the Irondequoit Creek basin near Rochester, New York: U.S. Geological Survey Water Resources Investigations Report 84-4259, 6 sheets, 1:48,000 scale. E. Miller, T.S., 1990, Sand and gravel aquifers of Schuyler County, New York: U.S. Geological Survey Water Resources Investigations Report 90-4073, 1 sheet, 1:48,000 scale. F. Miller, T. S., Sherwood, D. A., Jeffers, P. M., Mueller, Nancy, 1998, Hydrology, water-quality, and simulation of ground-water flow in a glacial aquifer system, Cortland County, New York: U.S. Geological Survey Water-Resources Investigations Report 96-4255, 84 p., 1:24,000 scale. G. Miller, T.S., 2000, Unconsolidated Aquifers in Tompkins County, New York: U.S. Geological Survey Water-Resources Investigations Report 00-4211, 1 plate. 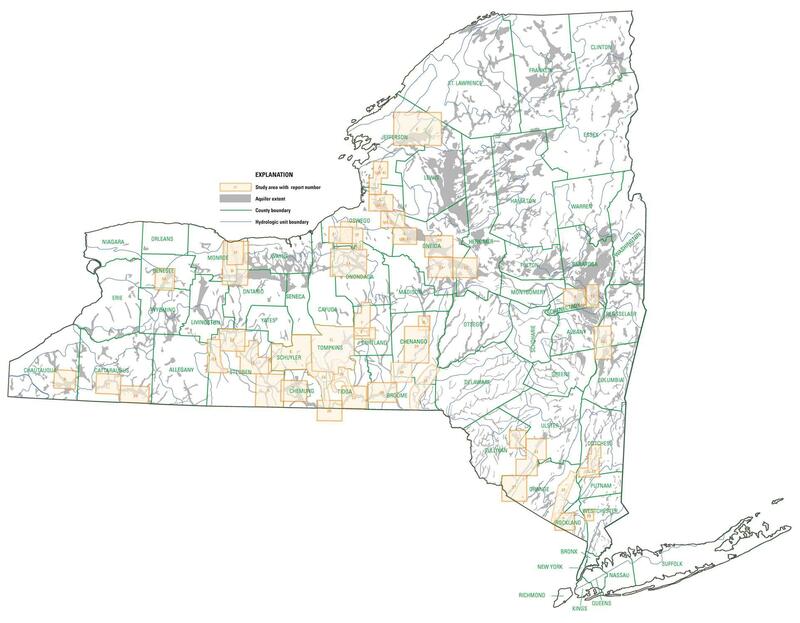 Cosner, O.J., 1984, Atlas of four selected aquifers in New York: U.S. Environmental Protection Agency Report, Contract No. 68-01-6389, Task No. 17, 102 p.
Waller, R.M., and Finch, A.J., 1982, Atlas of eleven selected aquifers in New York: U.S. Geological Survey Open-File Report 82-553, 255 p.